NEW YORK -- This week picked up right after Bibiana's and Krystal's big blowup. Krystal could really care less, yet Bibiana is feeling great about standing up to her, despite it having no effect. Chris Harrison came by to drop off the first date card and said, "Behind every strong man is a very strong woman." The card read, "Maquel, Jacqueline, Lauren B, Tia, Marique, Bekah, Bibiana, and Krystal, It's all about the ring." The girls guessed it right away, it's a wrestling date. On the group date, Chris introduced Arie as "The Kissing Bandit" and said he's 6'2" and 185lbs. Chris called the ladies GLOB, which stands for "Gorgeous Ladies of the Bachelor" Wrestling. Angelina and Ursula from "Gorgeous Ladies Of Wrestling" otherwise known as GLOW from the 80's. They were there to train the women so they could put on a show for a crowd of people who would be watching them compete for Arie later. Lauren B. had a really hard time because she felt awkward and the GLOW ladies were upset that most of the girls were laughing. They started ripping on Bibiana's name and yelled at Bekah for laughing. They were trying to get them revved up, but Bibiana and Tia didn't handle it well. They didn't get it at all. They sat in a corner and cried together. Will this be Arie’s last handshake? Arie came in and told Tia that he felt uncomfortable with the whole thing too, but urged her to try her best to have fun with it. Tia and Bibiana teamed up to try to support each other through this experience. Before you knew it, it was time for the big show. Arie had to wrestle too! Guess who was back, Kenny from "The Bachelorette!" AKA "The Pretty Boy Pit Bull Kenny!" It was great to see him again, although Arie might not have felt the same way. Kenny is a big dude! Kenny slammed him time and time again! The ladies could hardly watch. He did let Arie win a round too, probably just so he wouldn't look bad in front of the women. Out of the ladies, Krystal took it extremely seriously and was too hard on Jacqueline as they were wrestling. Meantime, Marique and Lauren B. got very sensual and the audience even seemed uncomfortable by it! Tia and Bibiana did a good job and seemed to salvage the day. Later that night, they had a cocktail party in an upscale trailer park called Caravan Outpost with the eight ladies from the group date. Arie told all of them he was proud of them for trying their best, and he also said he liked the insight into who was friends and who wasn't. Krystal grabbed Arie right away of course, "Byyyeeee guys," she whispered in her baby voice as she led him away. She asked Arie if he wanted her to be aggressive, and he told her to do whatever is her. So she is going to go for it full force. Bibiana, no surprise, had a problem with that. She's stupidly going to bring it up to Arie. You never, ever, waste your time with "The Bachelor" talking about another girl! As predicted, Arie said he hopes Bibiana can focus on them and not on what's going on with the drama in the house. Arie told Tia that he felt like "the man" being able to comfort her while she was crying back at on the wrestling date. They made a real connection and he really seems to like Tia! They shared some passionate kisses. Arie asked Bekah about her longest relationship, and she said two or three years. Was it back in 8th grade? She talked about how she was heartbroken, but then she hardly cared. It will be interesting when he finds out about her age (14 years his junior.) While they were kissing, he even flipped her around. Wowza. Arie grabbed the group date rose and gave it to Bekah to Krystal's dismay. Krystal keeps thinking they have the strongest connection, but Bekah is creeping up! She's a contender! The following day Krystal talked about her hardships of being beautiful and how both men and women want her. Um, OK.
A date card arrived at the house and it read, "Lauren S., You had me at Merlot!" She's the 31-year-old social media manager in case you forgot! Lauren arrived at an airport and she and Arie took off on a private jet for Napa. They walked through the amazing scenery at Hall Winery. They sipped on some red wine as they strolled hand-in-hand. Lauren and Arie sat and talked about how they are older and going to bed earlier, and Arie joked about how he wears more cardigans now. It was cute. That evening, they sat down inside a building full of wine barrels and a beautiful wood community table, and they had it all to themselves. Finally, they got into talking about past relationships and some more personal details. She said that she lived with her ex and it was a very passionate relationship, but they grew apart as she became more involved with work. Then she quickly got into talking about her family and then her friends and she was just all over the place. She babbled on and on and on! Poor Lauren! She knew it too! She tried to regroup and be herself, but Arie picked up the rose and said that he couldn't give it to her. He said he didn't even know why. Arie told her that it was his first really hard goodbye, but that "the spark just wasn't there." That's so sad! She does seem like a great person! Then they did a weird production of Arie walking around as violins played with him sadly holding the rose. It was just strange and a little creepy. Back at the house Caroline can't stop crying because Lauren was her good friend and Krystal won't stop preaching about how you have to make the most of your alone time with Arie. The last group date card arrived and it said, "Ashley, Becca, Brittany, Jenna, Caroline, Chelsea, and Annaliese: Love is ruff." The women cheered when they realized R-U-F-F meant it was a date with dogs. Annaliese started freaking out because apparently she had a traumatic experience with a dog as a child. Let's hope it's not as serious as the "Bumper Car Trauma." Arie walked up with his dog to meet the ladies and he blew a whistle and a pack of cute dogs came running their way. It was so adorable! A lady with "Dynamo Dogs" showed up and told them they'd be putting on a dog show for a crowd of people. Annaliese said as a little girl that "Sunshine" the dog bit her when she was at her grandparents' house and she almost lost her eye. Something tells me that she's probably exaggerating that story. 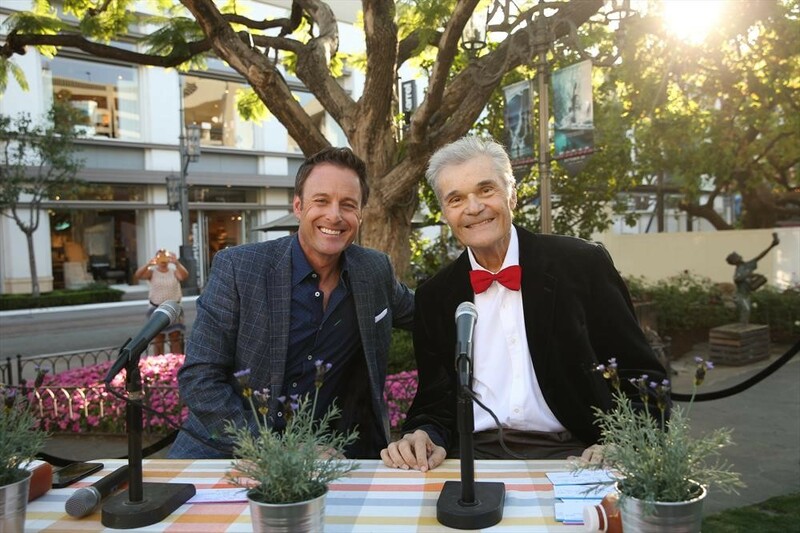 The ladies and Arie walked the dogs over to "The Grove" in LA where Fred Willard from the movie "Best in Show" was there to help run commentary on the event with Chris Harrison. Fred loved watching Chelsea, but the dog tricks, not so much. The dogs refused to listen to her! Jenna didn't fare much better. Annaliese had to work the pooper scooper, but she handled it with class. The dogs didn't want to listen to any of the women, it wasn't a great show, but Arie still just wanted to see them have a good time. In the evening, they shared some drinks as Arie looked to get to know the ladies better. Chelsea was thrilled that he wanted to talk to her first. Chelsea said she loved seeing him with all of the dogs and all of the kids who were at the dog show earlier that day. Arie seemed to really like Chelsea and said he appreciated seeing her caring side. Another frontrunner on this date seems to be Caroline. He's taken a liking to her and is talking a lot about his past relationships with her. He seemed to want her to stop talking so he could kiss her! Meantime, Annaliese keeps lamenting over how she wants to get time and make a special connection. But, Arie is just chatting and kissing ALL of the ladies except her. Finally, she went up to him to get her time. She didn't know what to say so she asked him how he's been. She tried to keep it light, but he asked her the worst question ever, "So how do you think it's going?" Eeek. Then Chelsea interrupted. It seemed like a good time, because he clearly didn't want to kiss Annaliese, but dove right in to sucking face with Chelsea. During Arie's time with Becca they talked about how they missed each other between dates. He called her extremely genuine and they agreed they are both dorky. They shared some passionate kisses and Becca is falling for him already! In the end, Arie decided to give the date rose to Chelsea! Poor Becca, she just sat there and smiled. She's trying to keep her head up, and thinks she will get a rose at the rose ceremony. It was time for the cocktail party before the rose ceremony, and the tension was high. Bibiana set up a telescope with a bed and some note cards in the hopes of giving Arie a little date where they can focus on them and not the drama. But, Arie stumbled across it with Lauren B. and they enjoyed it before Bibiana could bring him over to it! She walks over and Arie is kissing Lauren B.! Then Arie proceeds to bring every woman over there to chat! In his defense, he had no idea that it was Bibiana and not the producers who set it up. During his time with Bekah, she told him that she doesn't need him to complete her and that's why he may feel guarded with her. He said that he loves that she's "so risky" for him. Arie set up some hay bales for Tia to remind her of her country home. They drank some moonshine together and then they laughed about sweating due to the strong drink. She loved that he planned something special just for her. She said she was worried because she didn't have anything planned for that night, but he did! Annaliese is the only person who hasn't kissed Arie at this point. She put on eight layers of lipstick and then took Arie to the balcony. The other ladies looked on. Arie called her out for being nervous and she pretty much flat out asked him to kiss her and he said, "I don't think we're there yet, I'm sorry!" It was awful. He should just send her home now and not make her wait until the rose ceremony. It's so hard to watch! After he made out with a few other girls, Annaliese went back for clarity. He told her he hadn't put much thought into it, but now that she put him on the spot, he said "I don't see a future for us." Ouch. He tried to be nice, but direct. He offered to walk her out and she graciously accepted. Guess who never got time, poor Bibiana who made that whole romantic set up for him! That meant Bibiana was going home, and she was the only one eliminated at the rose ceremony because Arie had eliminated Annaliese earlier and Lauren S. during the one-on-one date. Arie told Bibiana that she was amazing, and she said "I know." She knows she deserves true love and was hoping someone will "give her a break," because she has tried but, "You can't force something that isn't there." Next week, the bachelorettes and Arie hit the road for Tahoe! Bekah's age will finally come out! I can't wait to see that. Krystal continues to bring the heat and it seems more ladies will waste their time trying to talk to Arie about her. The show closed with reenactments playing as Annaliese talked about her various "dog traumas." It was hilarious!